The working machine of the American Bigfoot Society (ABS) are the hard working, honest, and dependable investigators that share the group values. Some are field investigators, some work from the comforts of home or a library, but the goal is the same, investigation and discovery, of one of America's last great mysteries. Ohio, West Virginia, Washington, Virginia, Minnesota, Wisconsin, Texas, Louisiana, New York, South Carolina, North Carolina, Mississippi, Pennsylvania, Tennessee, Maryland, Illinois, Florida and New Mexico. Below is a list of just some of the American Bigfoot Society Investigators. If you are interested in becoming a member of the ABS, please follow this link: Join The ABS. Daniel Falconer is a New Zealand based designer and writer working in the special effects industry.He has both a degree in design and also studied zoology at university. Daniel designs creatures, costumes, props and weaponry for film and television and has worked on big films including The Lord of the Rings trilogy and King Kong. Daniel is deeply interested in the subject of Sasquatch, finding the eye witness accounts compelling evidence of there being something to the mystery, though he has never seen any sign of the creature himself. He currently offers his services as a professional artist to create highly realistic artwork for witnesses based on their sightings and can also apply his experience in special effects to the analysis of alleged Sasquatch photography. Rob resides in NW Louisiana, and has been involved in Bigfoot investigations and other cryptozology related research since 2003. Being so close to reported Sasquatch activity, it was only a matter of time before I began my own quest to solve this mystery. All my life, I had been familiar with Bigfoot reports from the northwest, but became actively interested in the Bigfoot mystery after gaining knowledge of numerous reported sightings in areas of south east Oklahoma. I soon realized this was a national and even worldwide phenomenon. Though my interest in Bigfoot research began more recently, it quickly became something I spent a good deal of time doing. And being in northwest Louisiana it is easy to find an excuse to get out into the woods and conduct research. I have conducted numerous investigations at many locations in the 4 state area of Louisiana, Texas, Oklahoma and Arkansas. My investigations have taken me to areas in North East Texas such as Caddo Lake, Monster Central in North West Louisiana, the Sulphur River Bottoms near Fouke Arkansas and Northern Oklahoma where I had a possible encounter with a creature in February 2008. I also spent a week with a team of researchers investigating reported ongoing activity in Northern Kentucky, where we broadcast our nightly reports via a live internet feed.I have four objectives: to have personal experiences, probe for the facts about witnesses sightings, document evidence whenever possible and ultimatly bring the species into main stream science in order to ensure their preservation. I might add, that I feel we are on a curve of sorts. As time moves by their ability to ensure their own preservation, which they have been adept at doing, is decreasing. This is primarily due to human encroachment via developments into their habitat. I also believe the vast highway systems that already exist, and that likely will be built in the future make their migrations more problematic. Hugh Phillips is 42 years of age and resides in Logan West Virginia. Hugh has conducted active research for over 20 years. He has investigated sightings West Virginia, South Carolina, North Carolina, and Kentucky. Hugh's other past times include reading, history, sports, classic films and internet radio. Tommy Ray - South Eastern Regional Director. 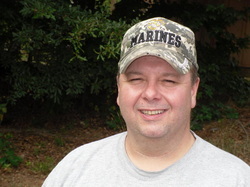 Tommy resides in South Carolina where he is a senior operator for a chemical company. Tommy is veteran of the United States Marine Corps where he served in communications for an amphibious assault vehicle unit. His interest in Bigfoot started at a young age from tales told to him by his grandmother and local folklore. Over the years he has done field research with the goal of just proving to himself that Bigfoot exists. Tommy enjoys practicing wilderness primitive skills, kayaking, fishing, and camping. Martin Edwards is a native of Appalachia who lives with his wife and children in western North Carolina. An occasionally-working freelance writer, Edwards has also held day careers ranging from magazine editor to fly-fishing instructor. For a time he also served as a pedorthist for area hospitals. This foot specialist is required to own a deep understanding of foot anatomy and function as well as be adroit with plaster. Edwards got into the broader cryptozoology field in 2000 when he wrote an essay for National Public Radio about the eastern cougar, which at that time was denied by all agencies to exist east of the Mississippi. The local station manager distrubuted his phone number to the many callers who claimed to have seen big cats in the southern highlands and who were eager to talk to anyone who wouldn't think they were crazy. Edwards was first introduced to sasquatch researchers in 2002 while on assignment for a national outdoors magazine. After attending an expedition in West Virginia in 2002, the Halloween-issue spoof was never submitted, and he was left to contemplate the strong evidence that the animal of legend does in fact still roam the forests of North America. 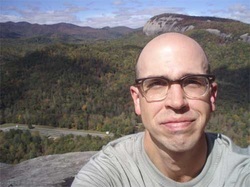 Edwards is a writer who enjoys gardening, fly-fishing, trail running, mountain biking, backpacking and hiking with his family and friends in the mountains around Asheville. 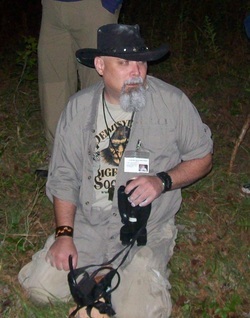 His introduction into bigfoot research came with an expedition in 2002 with the Bigfoot Field Researchers Organization. Since, Edwards has kept ear to the ground for any rumor of activity in the southern highlands of Southwest Virginia, Western North Carolina, East Tennessee and North Georgia. Eric is an avid outdoors man with a formal Biological background. Eric's interest in Sasquatch began as a child watching the show The Six Million Dollar Man, his mother explained to him what Sasquatch was and from that point he has been interested in mythical creatures, folklore and the truth. He enjoys the outdoors and is a fisherman and has traveled to some of the most remote locations on Earth in the search of great fishing and memories with his father and friends. He is on the board of directors of a international martial arts association. His hobbies include martial arts, fishing, hunting, gun and watch collecting. And, has been interested in the Bigfoot phenomenon since the age of 12, after his mother bought him a book on the subject. 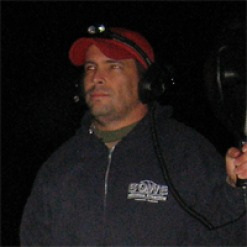 Dave is also a field investigator and mid state Assistant Director for the Pennsylvania Bigfoot Society and field investigator for the Center for Unexplained Events. Dave shares his love for this mystery and the outdoors with his wife Carey and their two boys. 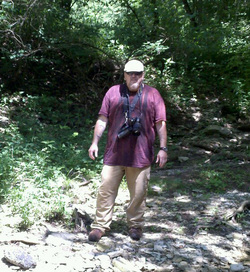 Dave's other interest include hiking, geo-caching, camping, and avid bow hunter. Henry May was born in Jacksonville, Florida, March 26, 1970, and will be 37 this year. Henry developed an interest in the Sasquatch at age 6, when he saw his father with a copy of a book called "Bigfoot: The Mysterious Monster," and also seeing the late Andre the Giant as the Bionic Bigfoot on the "Six Million Dollar Man television series. Later that year, he saw the episode of "In Search Of..." about Bigfoot, and a year later saw "Bigfoot: The Mysterious Monster" on TV at his grandmother's house. These things really got him hooked on Sasquatch and all things cryptozoological. He read every book he could find on the Sasquatch, and got his first exposure to John Green in 1980 with his opus "Sasquatch: The Apes Among Us." He continued to read everything he could on the subject and also watch every TV program about the elusive giants. He moved from Tennessee to Pennsylvania to Georgia, still interested in the subject; in Georgia, he had some possible and "not sure" encounters with something which may have been a Sasquatch. When he moved to Mississippi in 1984, he had several other "not sure" encounters. He has heard strange sounds and found tracks, but had his first definitive sighting in 1998, January 13th, at 1:15 A.M. He was driving north on Highway 61 between Leland and Shaw, Mississippi, when he spotted what appeared to be an individual crossing the highway from left to right across the highway. When he reached the point to where this individual crossed the road, he saw standing in a ditch a large, hairy, dirty-white creature which did not look at him, but only stood there, its back to the road and a side profile seen. A large bicep was seen, as well as rippling muscles in the back; the sighting took place within 15 seconds. SInce then, Henry has been deeply interested in the subject, but has really come out in a strong way within the last 3 years as an advocate of these creatures. Henry has over 80 books on the subject or similar phenomena, as well as two footprint casts from California, one given to him by his good friend M.K. Davis. He has an autographed picture by Bob Gimlin of Frame 352 of the Patterson Movie signed by Bob Gimlin, as well as many hours of Internet Radio programming featuring interviews with Sasquatch Researchers, as well as numerous DVD's on the subject. Henry is currently a member of several groups-the American Bigfoot Society, the Pennsylvania Bigfoot Society, the International Bigfoot Society and Sasquatch Watch of Virginia, as well as the founder and President of the Southeast Sasquatch Association, founded in 1994. He is also currently the co-host of the "Sasquatch Experience," an Internet radio program found at Blog Talk Radio which airs Sunday nights at 9:00 Eastern Standard Time. Henry believes in a strict no-kill policy when it comes to the Sasquatch. In 1960 I came upon a strange large track in the middle of a field and this was the start of my lifelong pursuit of the strange and unusual. I have traveled the country investigating everything from ghosts to UFO'S to numerous strange animals , especially Sasquatch. Over the years I have done a large number of interviews and taken reports from many states. I lived in Anderson County Kentucky for over 40 years and many of my investigations were in Kentucky. I now live in south east Virginia and travel several times a year to Kentucky to investigate cases and others activities connected with my research into various anomalies. I hold an Advanced Class Federal Communications Commission Radio and Station Operators License and I also have a technical background in computers. I have spent many years working with photography and video production and I am an author. I have a deep passion for investigative research into the mystery of Sasquatch and I am a no kill proponent. ‎25 years as a Baltimore County police officer, retired August 2011. I have experience backpacking in wilderness areas in Virginia and various remote trails in Md, Pa, & Va. As a police officer, I have investigated numerous criminal cases and missing persons cases. I have attended numerous schools over the years including the following: Criminal investigations, dealing with the mentally ill, traffic accident investigation levels one and two, domestic biological terrorist incidents, riot control, terrorist bombings, critical incident command, and others. after hearing some hunters tell their experiences with running into a large man like creature that scared the day lights out of them. She then started looking into the phenomenon of Bigfoot and realized how many people have had run ins with these creatures and soon became a believe herself in the creatures existence. Kara is eager to start her field research in New Mexico and looks forward to gaining her own Bigfoot experiences. When Kara is not searching for Bigfoot she is a mother of two beautiful boy and a wife to her husband James. She is also a part time student and runs her families furniture store. Kara’s field of study is in Human Behaviors and once she graduates with her Bachelors degree she hopes to open her own behavioral health center.